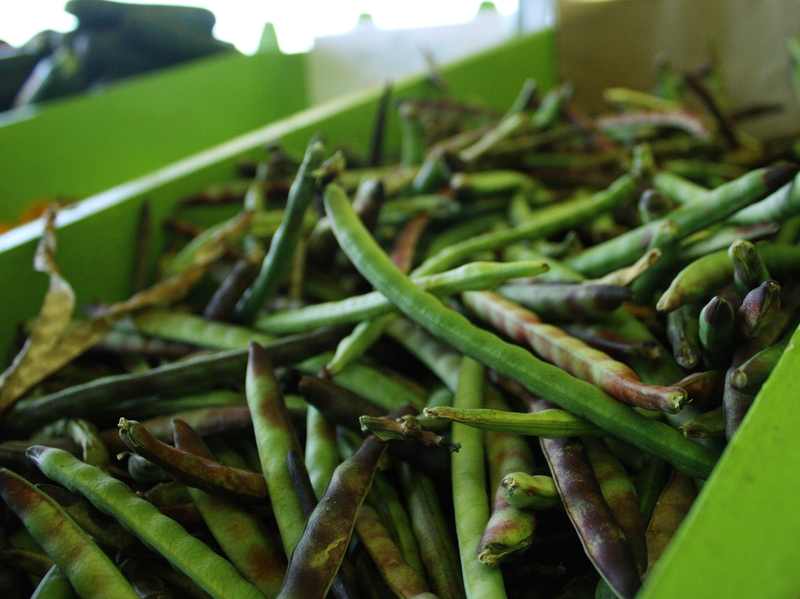 Crowder peas are a common southern variety of cowpea bearing pods with closely spaced seeds. The pod has a beautiful aesthetic of mixed green and purple values. 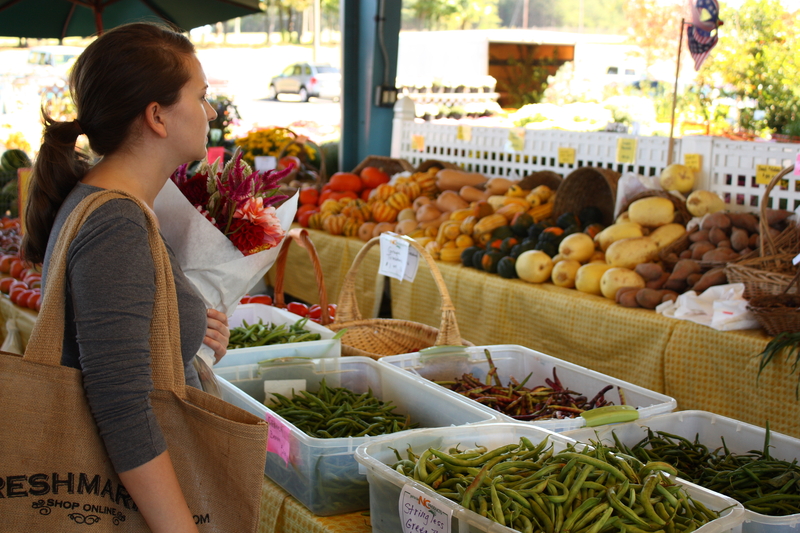 This Saturday during my family’s weekly Farmer’s Market visit we picked up several vegetables for my 6 month old daughter’s baby food as well as the crowder peas to incorporate into our Saturday Meal. 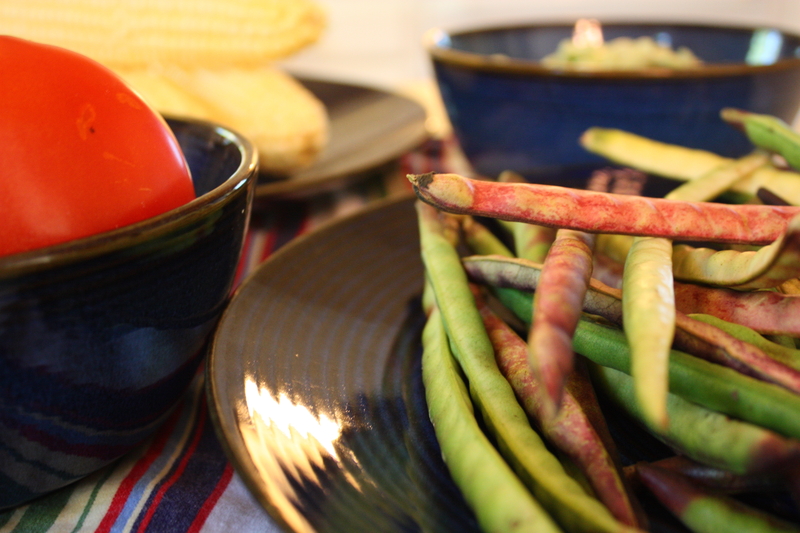 I remembered seeing my Grandmother sit down at the kitchen table on late summer afternoons with a large silver cooking pot and bowl abounding with these unique pea pods. She would shuck away the peas as she sipped on sweet tea and entertained her family with conversation. Just the memory tempted my appetite for these southern earthy flavored beans that look very similar to black eyed peas when shucked away from their colorful pod. My husband and I dined this evening on a flavorful NY Strip Steak from a local cattle farmer and fresh succotash with ingredients from our Farmer’s Market trip. We enjoyed the meal as the twinkling lights, we hung from our outdoor umbrella, set the perfect stage for a romantic southern meal on a cool crisp autumn evening. 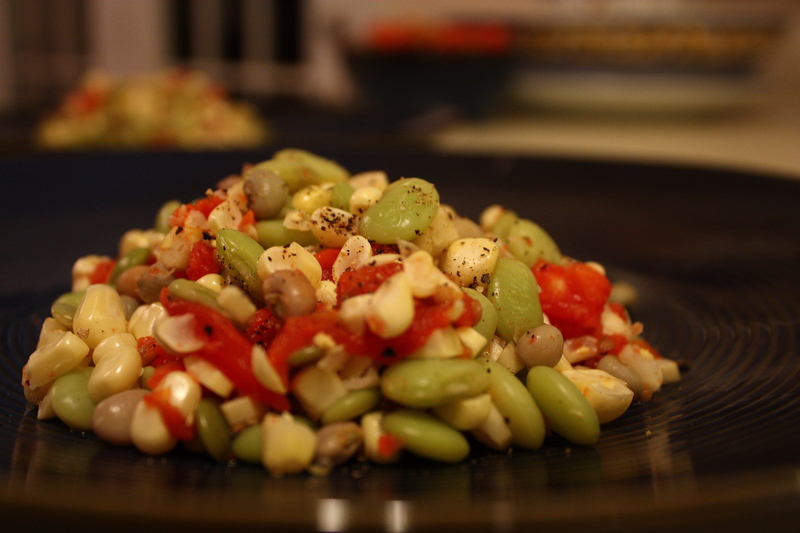 I have shared the succotash recipe below. Succotash is a food dish consisting primarily of corn and Lima beans or other shell beans. Enjoy! Stew tomatoes for 1 hour with salt, pepper and brown sugar. Broil crowder peas and lima beans in seperate pots until beans are soft but not over cooked. Drain, rinse with cold water and set aside. For best results cook with 1 to 2 cup of water max to retrain natural juices. Shuck corn and cut fresh corn kernels off the cob. Set aside. In a large serving bowl combine all ingredients. Serve at room temperature and garnish with coarse pepper and chopped basil if desired. The local Farmer’s Market has become my Saturday haven. This a wonderful time to buy a variety of delicious apples, pumpkins, and sweet potatoes. Every time I visit I challenge myself to buy the most unique looking vegetable to create an original meal. 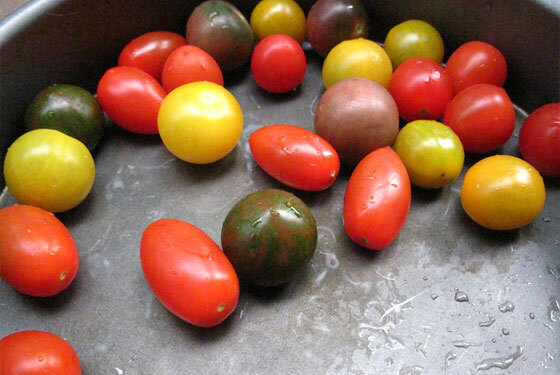 Saturday’s “prize find” were heirloom cherry tomatoes. The beautiful green crate was filled with perfectly plump, small tomatoes in yellow, orange, red, and purple speckled green values. An aesthetically pleasing addition to liven up any meal. I have shared below two of my simple, comforting recipes using the heirloom tomatoes. (14) Shrimp. Remove Tails. (7) Per Plate. Cook grits as directed. Stirring in 1/4 cup sharp cheddar cheese and course pepper to taste when complete. Set Aside. Broil 4 slices of turkey bacon till crisp. For best results cook on stoneware. Set Aside. In a large skillet pour 1/2 cup wine, add half a lemon juice, garlic and Old Bay seasoning. Bring to a boil. Add heirloom tomatoes and cook until slightly saucy. Add bacon and scallions and simmer for two minutes. Add shrimp and cook until pink. Serve on colorful plates and garnish with a thin slices of lemon and fresh green onions. Pour remainder of the wine to drink. Enjoy! Cut 12″ squares of brown parchment paper per serving. Place (1) Slice of Mayor Lemon in the center of each square. Add halibut steak on top of lemon and sprinkle with course pepper. Top with sliced heirloom cherry tomatoes, a few sprigs of thyme and capers. Fold parchment like an envelope. Place on baking sheet. Bake at 400 degrees for about 10 to 15 minutes. Cut top of paper open and serve in paper on a colorful plate with a side of wild rice. Pour Chardonnay to drink. Enjoy! *Cooking always enriched with low lighting, sweet husband kisses, Norah Jones and a glass of wine. You are currently viewing the archives for October, 2010 at SimplyFreshFare.